INDIANAPOLIS (CNS) — Indiana residents of all faith traditions can be assured the government will not infringe upon their constitutional right to freely exercise their religious beliefs, Gov. Mike Pence said as he signed into law a religious freedom bill passed by the Indiana General Assembly. 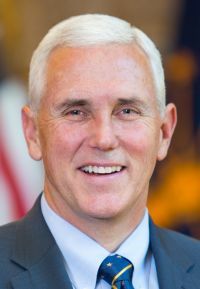 Since Pence signed it March 26, critics across the state and around the nation have raised concerns that the Indiana law could be a vehicle of legal discrimination against gay people and others. Some opponents have called for a boycott of the state. Many business leaders have publicly criticized the law. Sports figures have urged the NCAA Final Four scheduled for April 4-6 in Indianapolis’ Lucas Oil Stadium be moved. Hundreds of opponents rallied outside the state Capitol in Indianapolis March 28. AP reported that Angie’s List, a national consumer review company, has suspended a planned expansion in Indianapolis, and the American Federation of State, County and Municipal Employees will move its conference out of Indiana in protest. “Indiana’s law contains no reference to sexual orientation,” he said, adding that it “simply mirrors” the federal law, known as RFRA. The 1993 law says that the government “shall not substantially burden a person’s exercise of religion” unless that burden is the least restrictive means to further a compelling governmental interest.” It does not apply to the states, so with Indiana, there are now 20 that have passed such legislation. In a March 27 post on a blog for lawyers called IN Advance, Indiana trial lawyer Matt Anderson called his state’s measure a “vague and just a poorly written law” that he said could be applied to disputes between private citizens. “You can defend yourself in a criminal or civil action on the very broad basis of ‘any exercise of religion,'” which is how it could be used to discriminate against gays and others, he argued. In response to criticism, House Speaker Brian Bosma and Senate President Pro Tem David Long announced that the General Assembly will consider legislation to clarify the religious freedom law, which received a large majority of support from both chambers. The Senate passed the bill 40-10, and the House approved it 63-31. “This legislation will protect all faith traditions from government interference in the free exercise of religion. The legislation will help resolve disputes rather than create them,” said Glenn Tebbe, executive director of the Indiana Catholic Conference, which represents the church in Indiana on matters of public policy. In his opinion piece, Garnett pointed out that religious freedom laws have helped people of a broad variety of faiths. Professor Daniel Conkle of Indiana University’s Maurer School of Law has repeatedly sought to debunk the claims that RFRA allows for discrimination, citing current legal cases in support of his position. He testified during the House and Senate hearings, and reiterated his position in a recent opinion column in The Indianapolis Star. Conkle said in his column the Indiana law is “anything but a ‘license to discriminate,’ and it should not be mischaracterized or dismissed on that basis.” According to Conkle, even in the narrow setting of wedding service providers, claims for religious exemptions recently have been rejected in various states, including states that have adopted RFRA legislation. In his testimony before committees in both the House and Senate, Conkle said a state RFRA would establish a general legal standard, the “compelling interest test,” for evaluating laws and governmental practices that impose substantial burdens on the exercise of religion. Several House members spoke out against the bill during floor debate. Democratic Rep. Ed Delaney of Indianapolis called the bill “futile and destructive,” adding that he felt the bill would allow discrimination. House Minority Leader Rep. Scott Pelath, a Democrat from Michigan City, also raised concerns, saying that he also believed the bill would permit discrimination. Democratic Reps. Vernon Smith of Gary and Cherrish Pryor of Indianapolis, who are African-Americans, said even though they were devout Christians, they opposed the bill because they believed it could potentially cause discrimination. Republican Rep. Tom Washburn of Evansville said RFRA assists the courts in determining what happens when a fundamental right and a government interest come into conflict. Washburn added that the basic analysis of fundamental rights as it relates to a compelling government interest has been applied for many decades, and because of the new law, the standard will be applied to cases involving the free exercise of religion. Curtis Ayer is a correspondent for The Criterion, newspaper of the Archdiocese of Indianapolis. And where is the statement of the USCCB in response to this recently enacted legislation in Indiana? Is the USCCB in support of such legislation?